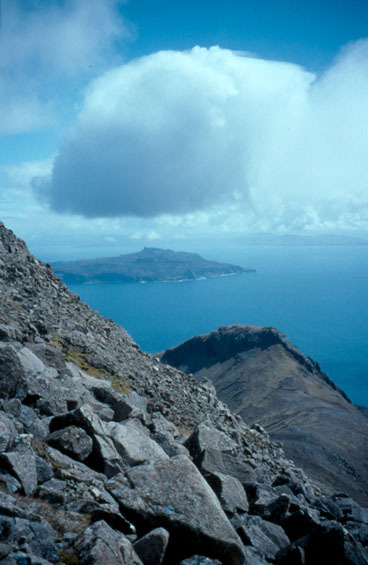 Located off the west coast, Rum is the largest of the Small Isles and is currently owned by Scottish Natural Heritage (SNH) who run it as a nature reserve. The island had one of the earliest recorded settlements in Scotland - Stone Age man taking up residence around 9000 years ago. Four thousand years later farmers began to clear the native woodlands to plant the land, supplementing their diet with fish, seabirds, deer and shellfish. Christian hermits lived on Rum in the 7th and 8th centuries - leaving carved crosses that can be found today. It was later colonised by the Norse - whose influence lives on in the hill names - and during the Middle Ages Rum fell under the dominion of the Lords of the Isles. Crofting and fishing communities numbering up to 400 inhabitants occupied the island until the Highland Clearances in the 1820s when the majority were packed off on ships to the Americas, their place taken by sheep. When the Marquis of Salisbury bought the island as a shooting estate in 1845 he reintroduced the red deer herds before selling it on to the Bullough family, industrialists from Lancashire, 40 years later. Having made his fortune through innovation in the textile industry, John Bullough enjoyed regular visits to his secluded island paradise, staying in the former Kinloch House. He built two shooting lodges for his guests and four shepherds' cottages for staff. 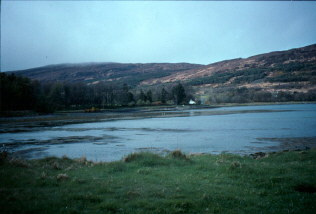 Bullough planted 80,000 trees around Loch Scresort and imported stags from deer parks in England to up the red deer population. He died in 1891 and his eldest son, George, inherited Rum at the age of just 21. The new owner spent much of his time on Rum and built the Doric temple at Harris to house his father's remains. His big project, however, was Kinloch Castle, a sumptuous summer palace designed by a company of architects from Halifax. Red Annan sandstone was shipped in for its construction and 250,000 tonnes of Ayrshire soil was deposited on Rum for the surrounding gardens. Three hundred men toiled for three years on the building, wearing Bullough tweed kilts and suffering at the hands of the island voracious midge population (smokers were paid an extra tuppence a day in an effort to keep them away). The castle was completed in 1900 at a cost of £250,000 (around £15 million in today's money) and it was filled with exotic treasures gathered by Bullough on his travels around the world. Outside there were formal gardens, a bowling green and nine-hole golf course and grapes, peaches, nectarines and figs grew in hot houses. Palm houses contained humming birds, turtles and mini-alligators, although the latter were shot after escaping (apparently the sudden exodus put the wind up his guests). A turbine house upstream from the house generated electricity, the house was central heated and was the first property in Scotland to have an internal telephone network. A steady stream of upper-class visitors landed at Rum over the years but at the start of the first world war most of the estate workers went off to the trenches. After the war the family visited the island less often and the estate began to fall into disrepair. George Bullough died in 1939 and in 1957 his widow, Monica, sold it to the Nature Conservancy Council for £23,000. Reserved for the gentry up until its sale to the nation, Rum got itself the reputation of the 'forbidden isle'. Thankfully, all that has now changed and visitors are made very welcome. To reach Rum you must first travel to Mallaig. After a night's camping at nearby Arisaig, Andy and I pulled into the west coast fishing port on an overcast Wednesday morning. Our 10.30am ferry departure was a full hour away so we grabbed a bite of breakfast at the fishermen's mission where an excellent full English can be savoured for just three quid. After making some last minute adjustments to our box of provisions (the shop in Rum has only a limited range of stock so you're advised to take all you need with you) we bought our tickets and boarded the Caledonian MacBrayne ferry MV Lochnevis. This sizeable vessel replaced the smaller and more basic MV Lochmor last year and is equipped with a comfortable lounge and a good cafeteria serving meals, snacks and drinks. The sailing takes around an hour and 10 minutes but our departure was delayed slightly due to a problem with the hoist used to lift in the various boxes of food, drink and fresh milk being shipped to the various islands. Once at sea, however, we watched our progress on satellite navigation screens installed in the lounge. It was the best place to be as, outside, the boat was being lashed by wind and rain, large waves breaking over the bows and sending spray back along the deck. The MV Lochnevis was sailing a course from Mallaig harbour to the southern tip of Skye before head out across open water to the mouth of Loch Scresort. Through the mist and rain we spotted several fishing trawlers riding the towering waves. The sky cleared slightly as we approached Rum and the optimist may even have claimed to see occasional rays of sunlit bursting through the grey cloud. However, we were to be denied views of the Rum Cuillin at we sailed into Loch Scresort. Construction is underway on a new ro-ro pier capable of berthing the MV Lochnevis. This is not due for completion until the autumn of 2001 and in the meantime visitors to the island have to transfer to the Rhouma for the final part of their voyage. A few minutes after decanting both ourselves and our luggage from the MV Lochnevis into this much smaller vessel, we were standing on a greasy slipway with a handful of other passengers. Once ashore, our first port of call was the SNH reserve office, a short walk from the slipway. The helpful staff based here will tell you just about everything you want to know about the island. With the rain lashing down and the campsite looking like a rather damp prospect, we enquired about the possibility of accommodating ourselves in one of the village bothies mentioned in the SNH literature. This, we were told, was not longer possible so we hiked along to the castle to see if there was space in the hostel there. Again, we were out of luck - due to an influx of conservation workers, all they could offer were the lavish £60 a night Oak rooms. So it was that we ended up pitching our tents on a grassy spot above the loch. The campsite at Kinloch is really only a campsite in name. You have to seek out a flat spot among the gorse bushes and reeds on the foreshore and the facilities are limited to two toilets and a couple of standpipes. By now the rain was easing so we decided, after a quick sandwich, to set off on a recce of the Cuillin. Our walk took us past the reserve office again to Kinloch Castle, a truly wondrous sight. A signed path skirts along the lawn below the south elevation of the two-storey building, leading into the woods behind and up past the generator building which continues to provide the island with its power, although now the hydro-electric turbine is supplemented by a diesel unit. After dappling our feet in a disinfectant bath we headed out of the forest on to open moorland. The path follows the burn up towards the mountainous bulk ahead, climbing steeply into Coire Dubh. Above a deer fence we found ourselves in thick mist and by the time we reached the bealach between Barkeval ('val' being Norwegian for 'hill') and Meall Breac, the rain was pouring down once again. We beat a hasty retreat and by the time we were back at our tents we were soaked. It was 4pm and our spirits had been dampened too by the weather. We crawled into our tents, vowing not to come out again until the weather improved dramatically, or the ferry home appeared (whichever was soonest). As is so often the case in the western isles, our prayers were answered and an hour later the thick cloud broke and the sun shone through (there must be a God after all!). Supper was soon on the go and Andy set about building a fire. Campers are asked not to take wood - even fallen timber - from the neighbouring woodland so we were grateful to whoever had left a small stack of branches by our tents. The damp wood was reluctant to burn but the remnant of an old pallet sparked things off and by 9am we sat by a roaring blaze, drinking red wine, cooking beef sausages and fresh mussels taken from the loch and watching the light fade over the loch. The great outdoors doesn't get much better! It was at this point we received our first human visitor - one of two young brothers who were to make regular appearances. He and his brother attend the tiny primary school on the island, but the wee lad was in sombre mood as the family would be moving to the mainland the following week and he was not looking forward to leaving his beloved island home. Everybody living on Rum - with the exception of the schoolteacher - is employed by SNH. The bottom line is that if you don't have a job with them, you can't stay. This seemed a rather unhealthy policy and without anything approaching a native population (not SNH's fault - it was the old lairds who turfed the island's original inhabitants off) there's a distinct lack of 'community' about Rum. The SNH staff tended to be on fixed term contracts, meaning their own futures on the island are not particularly secure. Rum also lacks a pub - a good focal point for any community. Residents tended to congregate outside the shop of an evening for a can or two of beer - not quite the same ambience as a comfy bar. Anyway, as our fire crumbled into white-hot embers and our newfound local guide headed for home clutching his Pokeman book (is nowhere safe from such modern day intrusion? ), we turned in for the night, hoping we'd seen the last of the rain. A squall of windy rain flapping the flysheets woke us early the next morning. Our worst fears were realised. It was 7am and raining, the perfect excuse to turn over and go back to sleep. An hour later we emerged to find the sun was actually shining. Up on the Cuillin, fluffy white clouds were breezing over the peaks. The day was still, the weather good. The expedition would commence after a breakfast of porridge and tinned peaches. Click here to read about our traverse. The Cuillin is the reason many visitors head for Rum. In all honesty, if you're not into hillwalking or conservation work, there's little else to do on the island. There are a few other options for walkers. A short nature trail along the south shore of Loch Scresort is worth doing and takes a couple of hours. There's a second nature trail in Kinloch Glen, again a short walk. A longer low-level route worth considering is the walk from Kinloch across the island to the bay Harris where the Bullough mausoleum sits rather at odds with its surroundings. One peak which we didn't do on but which we will return for is Orval (again the Norse influence), on the western side of Rum. It boasts an impressive 100-foot high pinnacle at the foot of its northern cliffs, which was first scaled (in the conventional way) by G.E. Little (a very brave man indeed!) in July 1985. To the north-west is Bloodstone Hill and, below, Guirdil Bay where there's an MBA bothy (there are two of these on Rum, the other is at Dibidil on the south-east coast). 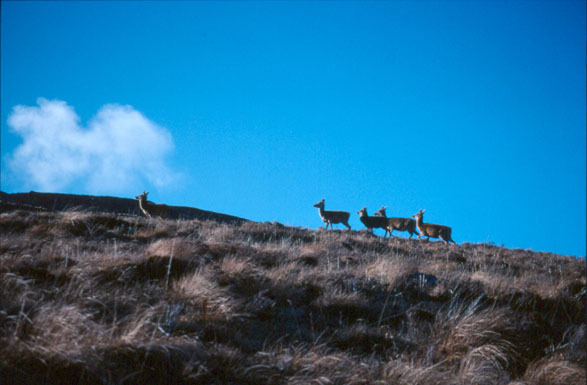 Access to the lands north of here is restricted due to the deer study programme and visitors are only allowed to follow the track up through Kilmory Glen to Kilmory on Sundays. Even with this restriction, however, there is plenty to occupy a few days on Rum, although we were denied access to all but the south-east portion due to the foot and mouth outbreak. Having completed the ridge, there was little else for us to do. Perhaps that was for the best, as J. Morton Boyd seems to have had such an approach in mind when he penned his introduction to Hamish Brown's excellent wee guidebook. In it he likens Rum to the drink that shares its name: 'a fine, strong liqueur taken in small measure - something cherished and never abused'. We'd had a taste, it left us wanted more, but we knew we must put the bottle back in the cabinet for another time. On our third and final day on Rum we ambled through Kinloch and enjoyed a wander round the castle grounds, peaking in through the windows, enjoying a glimpse of the unique artefacts inside. There are regular tours, but these usually coincide with large parties landing. As departure time approached, we dragged our kit back to the slipway and awaited the arrival of the MV Lochnevis. She arrived with over 60 new visitors aboard, the majority looking forward to a May Day bank holiday weekend of walking, climbing and scrambling. Our journey back to the mainland took us via Canna, the most northerly of the Small Isles. I'd last visited this tiny outpost of civilisation 14 years ago on a National Trust for Scotland conservation holiday. A few memories came back as we berthed at the pier just long enough to unload some supplies and take on a solitary passenger. Basking in the warm afternoon sun on the deck of the MV Lochnevis, we raised a can of lager to the Rum Cuillin as she drifted into the distance behind us. Important note Overnight visitors must inform the Reserve Office (Tel 01687 462026) that they are coming, prior to arrival. Visitors are usually met at the pier by a member of SNH staff. Map OS Landranger 1:50,000 sheet 39 (Rum & Eigg) - covers all of the Small Isles (Rum, Eigg, Muck and Canna). 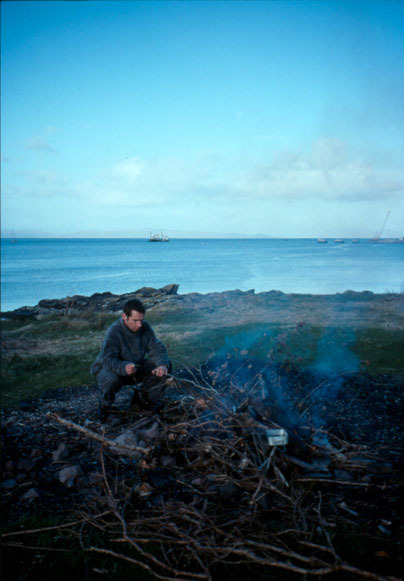 Further reading The Island of Rhum, A Guide for Walkers and Climbers by Hamish Brown (Cicerone, 1988); Rum - Kinloch Castle (SNH Publications and RCAHMS); Rum - Nature's Island (SNH Publications and RCAHMS); SNH also publish a small selection of leaflets. Accommodation Kinloch Campsite - very basic, £3 per person, per night. Book through reserve office and pay there. Tel 01687 462026. 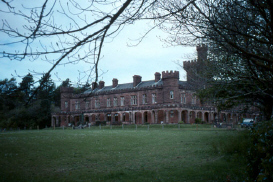 Kinloch Castle hostel - advanced booking essential. Tel 01687 462037. Kinloch Castle - Oak rooms (doubles) cost £60 a night. Tel 01687 462037. MBA bothies at Dibidil and Guirdil. No booking or payment necessary. Food and drink There is a shop and Post Office in Kinloch. It sells beer and wine, basic essentials, postcards and souvenirs, cigarettes, and midge repellents and nets. Kinloch Castle has a bistro (April-Sept) with table licence, open to residents and non-residents. It offers breakfast and evening meals. Booking essential. The community hall opens a few days a week (April-Sept) when a tea-room and craft shop are available. Contact with the outside world There is a phone box outside the shop and a public telephone at the castle hostel. Transport Caledonian MacBrayne sail daily (except Sundays) from Mallaig. 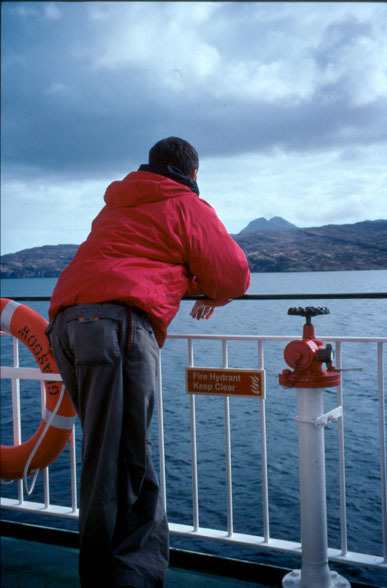 Log on to Calmac for timetables (Small Isles). The service to Rum is passenger only. Reservations are not necessary, except for large groups. A five day return ticket costs £12.85. ScotRail run rail services from Glasgow via Fort William to Mallaig. Free car parking is available next to the community centre in Mallaig. Best time to visit Statistics show Rum has its lowest rainfall in April and May while the wettest months are October and November. However, statistics are no real pointer when it comes to the unpredictable Scottish weather. We went in the first week of May, had changeable weather (on the whole, good) and the benefit of no midges. From late May through the summer and into the autumn the midges will be out. Rum has some of the worst midges in Scotland, so go prepared. Animals and insects Dogs - check the current position with the Reserve Office. Dogs are not accommodated at the castle. Midges - Rum has some of the worst midges in Scotland, so go prepared. Rats - These can be a problem at the campsite and bothies. Make sure you store food securely. Information The Reserve Office (normally open 9am to 12.30pm) will tell you all you need to know. Outside is an information point and notice board where details of community events, wildlife sightings, conservation work, etc, are posted.